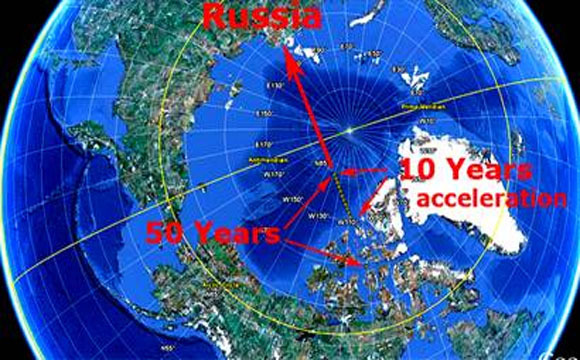 Arctic Circle to Siberia over the course of many years. It has been scientifically proven that the Earth undergoes a full geomagnetic reversal approximately every 780,000 years. These reversals are usually slow, occurring gradually over long spans of time. However, at the start of the 20th century that historical pattern appears to have been radically altered. All the nations that track this easily monitored data have validated each other’s scientific observations and data sets. Even NOAA has presented hard data which substantiates this ongoing geomagnetic shift. Hence, there is no mistaking the now generally accepted fact that the magnetic poles of the Earth are not only shifting in real time, but that they are moving very quickly. This phenomenon applies to both the North and the South Poles. The following diagram shows the precise movements as they are transpiring at the respective poles. The following video is quite remarkable for many reasons. It represents the first time that an authoritative account of the coming magnetic pole shift has been provided by a scientist who has been given access to highly privileged information and impressive data collection. In fact the only way that former NASA Scientist Dr. Salvatore Conti could have elaborated such complex information was by having been the insider that he was. The following video is less than one half hour-long, but only a few minutes of viewing will be necessary to receive the most relevant details. Those revelations begin at the 13 minute mark and continue until about the 19 minute mark. A word-for-word transcription of the most significant statements has been posted just below the video link. We are dealing with something completely alien so it’s pretty much trial and error thing going on. You have to understand these transmissions we are dealing with are not like the ones you get on our TV or radio. These aren’t pictures or videos. We don’t even know if the office can distinguish color or even see in the human sense. These messages are intelligently arranged sequences of bits and beats, gap and clicks, clusters of clicks, simple monochromatic bit maps. And we don’t know how they interpret them. That’s where my department comes in. We had to develop means for successful communication and at first there were just basic observations like letting us know that they know who and where we are that they like our planet and our star. But oddly enough and despite our insistence in questioning them they never specified where they were broadcasting from. They just say that we are not capable of understanding and don’t agree or deny that the signals are coming from the area where we believe they originate from. We believe they have understood what we sent them since very early on. It’s us who are still trying to interpret their broadcast. Their concepts are not on our level. They are hundreds maybe thousands of years ahead of us. And not just in terms of evolution but also of their understanding of the universe and its laws. After we started understanding some the things they were telling us, the office started sending us some scientific and technological information, most of which falls into the category of unintelligible data for us but some of which we can understand. And this is where the really bad news comes. On January 20th, 2011 we received a transmission from the office that wasn’t in reply to one of ours. It wasn’t on a 331 either. It was just on a day that we happened to have access to HAARP. We were still working on interpreting when 53 days later on March 14th, which was a 331 we received the exact same data again. The uniqueness of the situation and from what we had already gathered from the first transmission, it prompted a sense of urgency among myself and my colleagues. We don’t know how many times the message was sent from their end but in the next few months we received 2 more transmissions with the exact same data. By then it was relevant because within days of the 2nd recession we had agreed on the interpretation and well to be honest, and put it bluntly it sent panic throughout SARA [Service and Advice for Research and Analysis]. So we sent a transmission questioning the information, trying to verify if our interpretation was correct. This was on April 27th 2011. Last March 23rd we received a short simple [noise?] as in interstellar scintillation noise mentioned at 3:53], which confirmed our biggest fear with a very pressing YES. Now, very few people know about this, well until now, but some of our superiors disagree with parts of our interpretation about this extremely important information, and accordingly the NASA high brass has decided to keep his extremely secret, mostly to prevent a worldwide chaos and panic and maybe because they think there’s still time to deal with this. But you can’t stick your head in the sand. The message is what the message is. We’re 100% certain of it. And I’m going to explain it to the world right now. Our ET friends have given us a very ominous prediction. In a nutshell, our planet is going to go through a process we call a ‘CHILL MAGNETIC REVERSAL’ but a rare kind that happens very quickly, and its most intense drifting will take place between JUNE 14TH AND AUGUST 19TH 2016. Now a chill magnetic reversal does not mean the planet is going to flip over, and everything is going to shift and shake violently in apocalyptic devastation. The planet has actually gone through a geomagnetic reversals many times. Most of these happen very slowly over many years. But we are certain that they do happen every few hundred thousand years by looking at fossil records, which show changes in the magnetic orientation of rocks. So what are geomagnetic reversals? Put as simply as possible, our planet’s core is made of a giant, superheated solid metal ball covered with liquid metal. As both move and flow inside our planet, and the Earth turns this combination creates the dynamo effect which in turn creates the magnetic field around the planet. In a geomagnetic reversal changes at the core make the magnetic field unstable at first and then cause it to drift, and to finally re-establish itself with the poles in opposite positions from where they were when the reversal started. Now, the continents and oceans are still going to be where they are right now, it’s the invisible magnetic field that’s going to flip. By the way, let me make something clear here. Like I said before, this is not a movie. I once saw a movie in which the core stops flowing, so they have to do ridiculously unbelievable things to get it started again, or else the magnetic field would disappear and the Earth would get ‘fried by microwave radiation’ from the solar wind. As clear as that may sound it’s nonsense. What the [16:42 Alphies] are warning us about is unfortunately, real science. Now, when the last reversal took place, which was about 780,000 years ago, there were already some early ancestors of ours, and anthropologists haven’t found evidence that it caused any major alterations on those early humans. But that last reversal was like most are, very slow over many years. The reversal, [Alphies] say is about to happen is a kind that is very fast. For all we know the process may have started already and we may be witnessing events which are related to the 2016 event. Like all these weather changes, and seismological activity. The magnetic North Pole is migrating fast toward northern Russia. 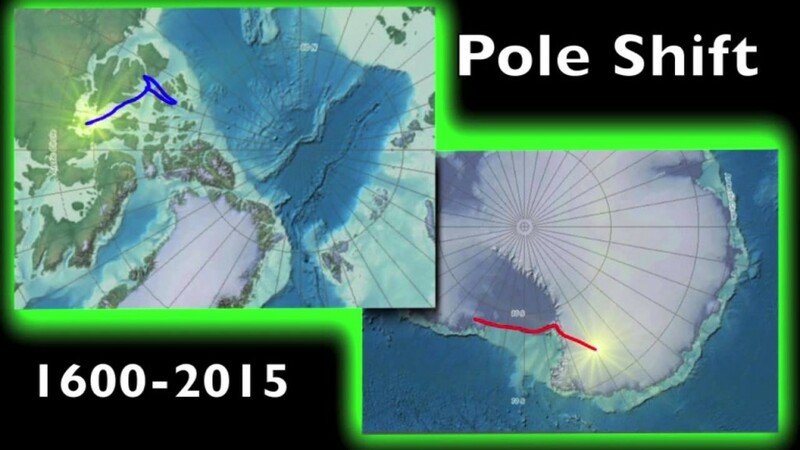 The fact is that the rate of polar migration for this next reversal will increase exponentially to a peak during the summer of 2016 when according to the [Alphies] in a period of 66 days it will amount to 124.72 degrees. That’s almost 70% of the total reversal in a little more than 2 months, something that usually takes hundreds to thousands of years. This event will be like one that’s been proven from analysis of the lava salts on Steens Mountain in Oregon. 15 million years ago a reversal took place in which the rate of change was as fast as 6 degrees per day. That’s over 3 times faster than the average drift of under 2 degrees per day, expected for June through August 2016. But this rate of change is fixed for the 66 days. The days in the middle of the period should be the ones with the fastest change. And here’s the rub! What the [Alphies] are determining and making us know is that in 2016 the quick change in polarity will make the Van Allen Radiation Belt to drop to Earth. What does that mean? Well, the Van Allan Belt is actually made up of 2 enormous clouds of highly charged particles that exist around our planet, and which are held in our planets magnetosphere by the magnetic field. 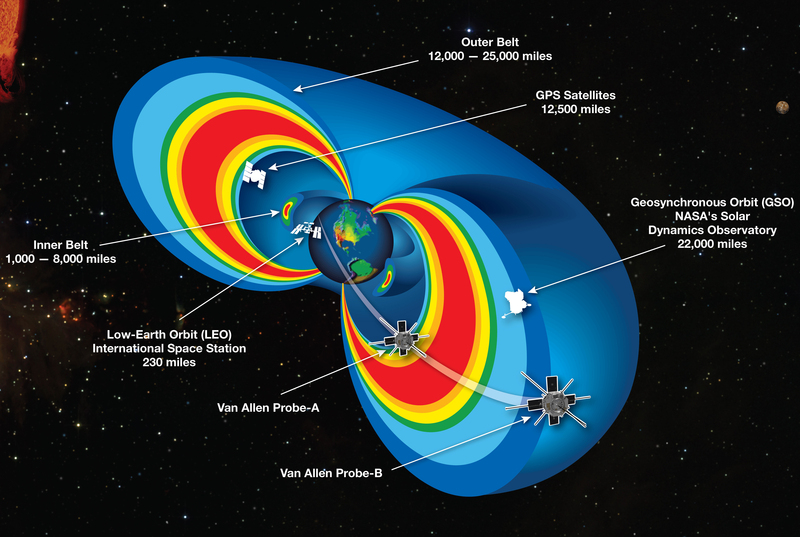 When the magnetic field becomes unstable due to the quick flip of its poles the Van Allen Belt will collapse and it’s particles will pretty much bombard the Earth with a lot of radiation. Based on what our alien friends say and from all calculations the amount of radiation that will reach the surface will be devastating. Most land based plant and animals, and those living near the surface of the sea will be killed, including an expected 75-80% human mortality rate. Those who do survive will be affected in ways we can only theorize not just physically, but physiologically and genetically. There is no question that the Earth’s magnetic poles are moving more rapidly than they have been observed at any point in human history. Given the significant uptick in earth movements, particularly volcanic eruptions, major earthquakes, methane releases and massive sinkholes, as well as the intensification of global climate change, the evidence is now quite compelling that there are other sources of Earth changes (intensification of solar activity, influx of cosmic rays, alteration in the movement/temperature of the Earth’s core, etc.). There is no stopping the ongoing geomagnetic pole shift; nor is there any slowing it down. The only remaining questions are when will it reach peak intensity and how will such a drastic movement in degrees affect the magnetosphere. The magnetosphere is well known for providing a blanket of protection around the Earth, without which the planet would be practically uninhabitable. Most importantly, it must be determined whether there is any truth to Dr. Conti’s assertions about the potential collapse of the Van Allen Belt — full or partial — and what that would mean for the biosphere and for humanity. The CCRG does not present this extremely sensitive information as though it is cut in stone. Things are changing so fast, however, that it’s now clear that there are multiple influences acting upon this plane of existence, which are occurring completely outside of the Earth realm. Therefore, the real question is: What exactly is triggering so much change within the solar system, especially the accelerated planetary transformations? When it was first released, Dr. Salvatore Conti’s video produced an immediate spate of videos and articles all falsely debunking — in unison — his YouTube presentation. That so many alternative news websites jumped on board this lynch mob initiative to invalidate Dr. Conti’s claims was quite breathtaking. By and large their debunking consisted of no proof whatsoever, as well as much idle speculation and conjured-up hearsay that they all kept repeating in their intimately connected echo-chambers. They even neglected to mention that the former Minister of National Defence of Canada, the Honorable Paul T. Hellyer, is an associate of Dr. Sal Conti. Watching this whole saga unfold gave very good reason to pause. Why was such an obvious scam by these supposedly alternative new sites used so fast and furiously to label Dr. Conti’s video an extremely elaborate and unethical hoax? Now that’s a VERY good question! Why Is The Whole SOLAR SYSTEM Undergoing Massive Changes?